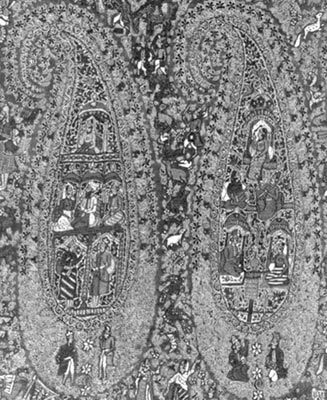 Excerpt from "Woven from the Soul, Spun from the Heart"
Excerpt from "Masterpieces of Persian Art: Safavid Textiles"
The Kashmir Shawl This article is taken from Mr. John Irwin’s book on Shawls, published by H.M. Stationery Office London, by courtesy of the publishers as well as the Victoria & Albert Museum London. The original book is available in India from H.M. Stationery Office Agents: c/o. British Information Services, Eastern House, Mansingh Road, New Delhi: c/o Messrs Thacker & Co. Ltd.,Bombay. Worn in this way in India, the shawl was essentially a male garment; its degree of fineness was traditionally accepted as a mark of nobility. Although a garment so simple in shape and form undoubtedly has a long history in the Near East,3 the finest shawls of the modern era are synonymous with the name of Kashmir. The origins of the industry in Kashmir are obscure. According to local legend, recorded more than a hundred years ago,4 the founder was Zain-ul-’Abidin. (A.D. 1420-70), whom historians have called the Akbar of Kashmir, in recognition of his enlightened rule and promotion of public works. Zain-ul-’Abidin was said to have introduced Turkistan weavers for the purpose. Although unproved, this suggestion is of some significance, for when we come to accounts of the industry in the early nineteenth century we find that one feature distinguishing it from traditional weaving in India proper is the technique employed. This technique has parallels in Persia and Central Asia but nowhere on the Indian sub-continent as far as evidence is available. Western textile historians have called it the twill-tapestry technique, because of its similarity in some respects to the technique traditionally employed in Europe for tapestry weaving. According to this, the wefts of the patterned part of the fabric are inserted by means of wooden spools (Kashmiri, tojli) without the use of a shuttle. Weft threads alone form the pattern; these do not run the full width of the cloth, being woven back and forth round the warp thread only where each particular colour is needed. In other respects, the Kashmir technique differs from tapestry weaving, the loom being horizontal instead of vertical, and its operation more like brocading. Applied to shawls, the twill-tapestry technique was slow and laborious and demanded a high degree of specialization. The traditional practice was for the patterned section of a shawl to be produced on a single loom (the field, if plain, being woven separately on a simple loom with shuttle). In the case of a rich design, this meant that a shawl might take eighteen months or more to complete. In the early nineteenth century, however, when designs became more elaborate and training methods more competitive, a new practice was introduced of dividing the work of a single shawl among two or more looms. In this way, a design which had formerly occupied one loom for eighteen months could now be produced by two looms in nine months, or by three looms in correspondingly less, and so on. After the various parts of a design had been separately woven, they were handed over to the needleworker (rafugar) who joined them together, the joins being executed with such subtlety and fineness that it is often impossible to detect them with a naked eye. In 1821, Moorcroft described this method of distributing work among several looms as a recent introduction.5 He mentioned as many as eight looms being engaged on a single shawl; but later in the century this number was often exceeded, and there was one report of a shawl being assembled from 1,500 separate pieces.6 These are sometimes called “patchwork shawls”. Another important innovation introduced at the beginning of the nineteenth century was the amli or needle worked shawl, which was ornamented entirely with the needle on a plain woven ground. (It must be added, however, that even the tilikar or loom-woven shawls often betray some signs of needlework because a rafugar or embroiderer was usually responsible for the final touching-up of the loom-woven pattern. This touching-up sometimes included the reinforcing of colours where needed, and occasionally even more fundamental modifications to the design). 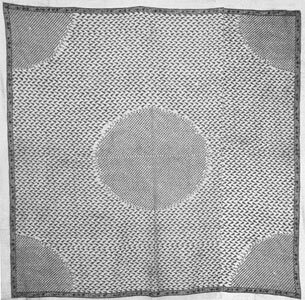 The type of shawl with an entirely needle worked pattern, however, was unknown in Kashmir before the nineteenth century. It was introduced at the instigation of an Armenian named Khwaja Yusu, who had been sent to Kashmir in 1803 as the agent of a Constantinopole trading firm. It had not previously occurred to merchants that simulation of the loom-woven patterns by the much simpler process of needle-embroidery on a plain ground required very much less time and skill, and consequently less outlay. 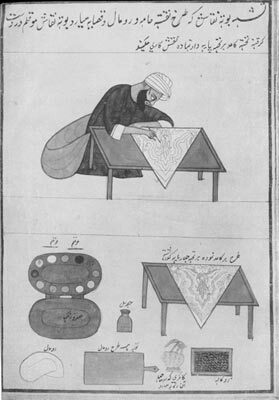 The ingenious Khawaja Yusuf saw his chance, and with the help of a seamster by the name of Ali Baba produced the first needle-worked imitations for the market at one-third of the cost of the loom-woven shawls.7 Besides this enormous saving in production costs, the needle-worked shawls at first escaped the Government duty levied on the loom woven shawl, which in 1823 amounted to 26 per cent of the value. As a result, enormous profits were made, and this branch of the industry expanded rapidly. In 1803 there were only a few rafugars or embroiderers available with the necessary skill for the work. Twenty years later, there were estimated to be five thousand, may of them having been drawn from the ranks of former landholders,8 dispossessed of their property by Ranjit Singh in 1819, when Kashmir was invaded and annexed to the Sikh kingdom. The material traditionally used for Kashmir shawls weaving was fleece derived from a central Asian species of the mountain goat. Capra hircus. This was popularly known in the West either as pashmmina (from Persian pashm, meaning in fact any kind of wool) or cashmere, from the old spelling of Kashmir. The latter term is particularly misleading, because all shawl-wool used in Kashmir was imported from Tibet or Central Asia in the first place and was not at any time produced locally. The second grade of shawl-wool was derived from domesticated goats of the same species, and this provided the bulk of the raw material for Kashmir looms. Prior to 1800, most of it came from Ladakh and western Tibet. Shortly after the turn of the century, however, there was an epidemic among goats in these areas, and henceforth supplies were derived mainly from herds kept by nomadic Kirghiz tribes and imported through Yarkand and Khotan. In the second half of the century the main source was Sinkiang, and in particular Turfan.15 As supplies at this period were seldom enough to meet demand, goat- fleece became increasingly expensive in relation to other wool. This encouraged adulteration and general falling off in traditional standards, which was undoubtedly one of the factors contributing to the decline of the shawl trade in the 1860s, to be discussed later. The earliest detailed account of the Kashmir shawl industry is that written by William Moorcroft between 1820 and 1823, preserved in manuscript at the Library of the old India Office (now the Commonwealth Relations Office), Whitehall, London. These reveal a situation in which division of labour was far advanced to the extent of twelve or more independent specialists being involved in the making of a single shawl. The Pattern-drawer (naqqash) and his implements. Painted by a native artist, C. 1823. Before weaving could begin at least six other specialists were involved. These were the warp-maker, warp-dresser, warp- threader, pattern-drawer, colour-caller and pattern-master. It was the warp-maker’s job to twist the yarn into the required thickness for the warp (usually 2,000 to 3,000 double-threaded warps being required for a shawl); the warp-dresser’s to starch the warps, and the warp-threader’s to pass the yarns through the heddles of the loom. The importance of the pattern-drawer, or naqqash, is indicated by the fact that he received the highest pay-far higher even than that of the weaver.20 Pattern-drawers were few in number, and in the second half of the century, when the industry was very much expanded, the art was still said to be confined to only five or six families. 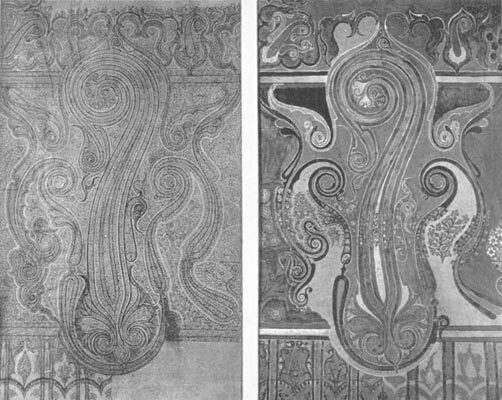 21 The pattern-drawer sometimes coloured his own drawing, but usually choice and disposition of colour were left to the colour-caller (tarah guru). With a black-and-white drawing before him, the colour-caller, beginning at the bottom and working upwards, called out each colour, the number of warps along which it was required to extend, and so on, until the whole pattern or section pattern had been covered. This was taken down by the pattern-master (ta’lim guru) and transcribed into a kind of shorthand intelligible to the weaver. 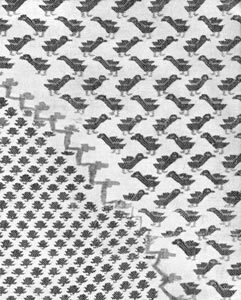 Talim or coded Pattern Guide as used by Kashmir Shawl Makers. shawl would hang better. However, this had the disadvantage of causing uneven shrinkage and sometimes spoiling the shape of a shawl when washed. There were two main systems of contract between the ustad and those who worked his looms. One was based on piecework, whereby the weavers received a fixed sum for every hundred spools passed round as many warps (allowing a maximum earning in Moorcroft’s time of about one anna or a penny a day per man, increasing to about double this sum in 1870).23 A second system was based on partnership, whereby the loom-owner advanced the loom and raw materials and took one-fifth of the net proceeds of sale. The spools or tojlis with which the weavers worked in places of shuttles were made of light smooth wood and had both ends charred to prevent their becoming rough or jagged in use. Each spool held about three grains of yarn; and the number used in the weaving of a pattern varied from 400 to 1,500, according to degree of elaboration. In the process of weaving, a cloth was faced downwards and the weaver inserted his spools from the reverse side. After each line of weft had been completed to his satisfation, the comb was brought down “down” with a vigour and repetition of stroke which appear disproportionately great to the delicacy of the materials.24 One of the ways by which merchants determined the quality or standard of weaving was by counting the number of comb-strokes or wefts to the girah (one-sixteenth of a yard). The weavers were the most oppressed section of the industry, the majority being depicted as ill-clothed, under-nourished, and permanently in debt. Moorcroft wrote that without the supplementary earnings of wife and children the average weaver could not even support a family. The earliest documentary references to the Kashmir shawl industry appear in literature of Akbar’s reign (A.D. 1556-1605), but unfortunately they throw no light on style. The earliest surviving shawl-piece in a public collection is a fragment preserved in the Calico Museum of Textiles, Ahmedabad (Plate 1). It consists of part of an end-border with a repeat of delicate, freely-spaced flowering plants, rendered in the semi-naturalistic style of the late seventeenth century. 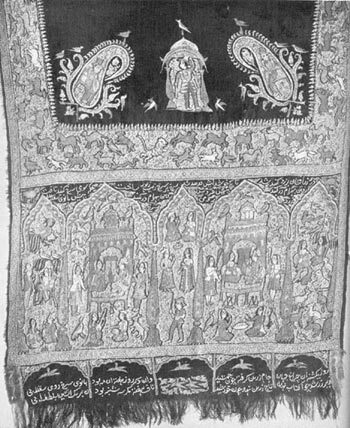 Shawls with similar end-borders are often depicted in portraits of the Golconda School of painting, a typical example being the portrait of Qutb-Shah at Illus. No. 1, facing p. 6. At this period the characteristic motive of Kashmir shawl-design was a slender flowering plant with roots (Fig. 1).41 It combined the grace and delicacy of Persian floral ornament (from which it was ultimately derived) with the naturalism characteristic of seventeenth-century Mughal art. In the early eighteenth century, this simple floral motive was treated more formally, and the number of flowers stemming from a single plant increased (Fig. 2). At about the same time it ceased to be depicted as a flower with roots and merged with another well-known Indo Persian decorative motive-the conventional vase-of flowers. Many of the eighteenth century forms betray their dual origin by retaining both the vase and the appearance of root-growth. 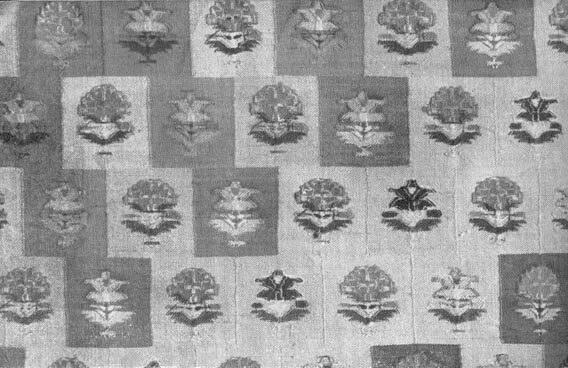 The name given to these floral motives was buta, meaning literally ‘flower’, and it was not until the middle of the eighteenth centrury that the outline of the motive began to harden into the rigid formal shape which later come to be known in the West as the cone or pine (but still unknown in Kashmir as buta). Although this motive had antecedents in Near Eastern textile patterns of the seventh or eighth centuries A.D. the cone in the varied forms in which it became associated with shawls was clearly the product of separate development. Independently of the Kashmir buta, another type of cone based on the leaf-form appeared more or less simultaneoulsly in Persian decorative art. This Persian form had an important influence on the subsequent development of the Kashmir cone, giving rise to a variety of cone forms which were common to Indo-Persian art of the period. A further stage was reached in the first quarter of the nineteenth century, when the Kashmir cone began to lose trace of its naturalistic, floral origin and became a purely conventional form (Fig. 6). This prepared the way for a final stage of abstraction when the cone became elongated and transformed into a scroll-like unit as part of a complicated over-all patterrn (Fig. 8). As guides to dating, the different stages in the development of the cone must be regarded with caution. Because a certain form came into vogue at a certain period, it did not necessarily follow that earlier types were supeseded. In fact, it often happened that the older well-tried motives and patterns outlived new. The nineteenth-century popularity of the Kashmir shawl in Europe undoubtedly owed much to romantic associations with the ‘mysterious and unchanging East’. The new popular journalism of the period was always ready to foster such associations, and this led to the publication of innumerable articles by unqualified authorities setting out to explain the alleged antiquity of Kashmir motives and patterns and even ascribing to them an elaborate symbolism. Typical of them is an article which appeared in the magazine Household Words, founded by Charles Dickens: “If an article of dress could be immutable, it would be the (Kashmir) shawl; designed for eternity in the unchanging East; copied from patterns which are the heirlooms of caste; and woven by fatalists, to be worn by adorers of the ancient garment, who resent the idea of the smallest change... 46 Repetition of such nonsense over a long period had its effect. On the one hand, it belied the true character of the Kashmir industry as a living and developing tradition adaptable to changing conditions; and on the other, it obscured the important influence exercised upon those changes by European taste. A distinctive feature of the cone at this period was its streamer-like bending tip, reminiscent of the earlier cypress-and-almond-tree motive of Persian art 49. By 1815, the semi-naturalistic floral cone had begun to give way to a more formal, abstract type (Figs. 6 and 7). Shawls with a diapered or trellised field were also coming into favour, and among these was the square shawl with a medallion in the centre and quarter medallions at each corner, known as the chand-dar or ‘moon-shawl’. In 1823, Moorcroft remarked that Persian taste favoured shawls in which the pattern ‘almost completely covers and conceals the colour of the ground’; and this probably refers to shawls of the type shown at Plates 20 and 21. Although Simpson’s explanation of the French contribution to Kashmir design is not very clear in expression or terminology, it nevertheless gives important clues. In referring to the ‘mediaeval richness’ of the traditional as opposed to the French patterns he probably had in mind the marginal ornament of mediaeval European illuminated manuscripts, before which the eye is made to wander restlessly, in convolutions, in marked contrast to what he calls ‘free and sweeping lines’ of the French or ‘rococco’ style, so characteristic of the late designs of both Kashmir and European shawls. Between 1850 and 1860, shawl exports to Europe more than doubled, far exceeding the total estimated output of the whole industry at the beginning of the century,55 In the following decade, however, there was a sudden contraction in the market. 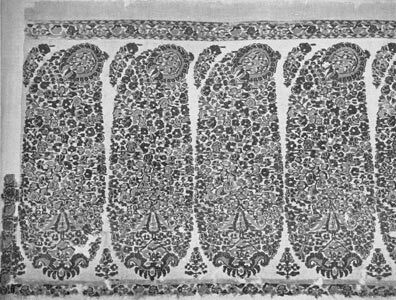 The average Kashmir shawl of that time (such as the example shown at Plate 52) was no longer equal to the best products of the Jacquard looms of Lyons and Paisley (Plates 48, 49 and 51), and yet were more expensive to buy. On top of this decline came the Franco-Prussian War of 1870-71, resulting in the closure of the French market for Kashmirs, and the simultaneous and quite sudden eclipse of the shawl as an article of fashion. From being the pride of every girl at ther marriage and coming-of-age, the shawl was relegated to the grandmother’s wardrobe. As a result, the Kashmir industry, so long geared to Western demands, was doomed. Collapse of trade was followed by the severe famine of 1877-79, when shawl-weavers were said to have ‘died like flies’. Most of the survivors, having hands so refined and delicately adjusted to the technigue of shawl-weaving that they were useless for most other occupations, subsequently died in destitution.56 Only the needle-workers experienced temporary respite, adapting themselves to the embroidering of coverlets, table-cloths and similar goods for the tourist market. Within a generation of its final phase of prosperity the shawl industry was dead, and the art of its weavers irrecoverably lost. 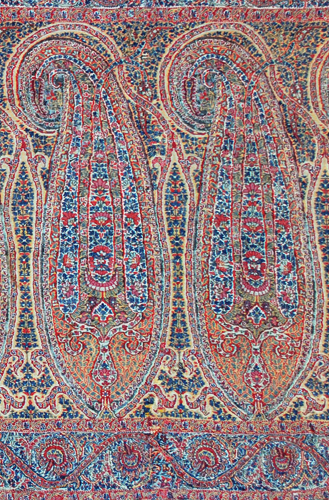 Besides woven imitations Persia also produced embroidered shawls in the Kashmir style. The fact that such shawls bear Persian inscriptions is not in itself an indication of Persian origin, because the Persian script was in common use in Kashmir. 2This definition applies for the purposes of this study. Shawls made entirely of silk cotton or materials other than wool are therefore excluded. 3Heredotus, in the fifth century B.C., described Egyptians as wearing a woolen garment in terms which indicate a shawl (Book II, 81). 4Baron Charles Hugel, p. 118. 5 MSS. Eur. D. 260. 6 Colonel J.A. Grant, quoted in Kashmir and its shawls (Anonymous) , p. 48. 7 Moorcroft, MSS. Sur. 113 pp. 33ff. 8 MSS. Eur. D. 260 p. 4. See Also MSS. Eur. E. 113, and D. 264. 9 The fact of the matter is that late ‘amli shawls’ are very variable in quality. A possible explanation is that the coarser kinds were made in the Punjab by less skilled hands. 10 To add to the confusion over the use of the term cashmere, the Birth textile trade has now adopted a new definition unrelated to the raw material. According to the Director of the Shirley Institute, Manchester “the term is used to describe, a certain type of cloth formerly woven from yarns spun from goat fibres”, and he includes cloth woven with any high-quality wool yarn. “The weave must be 2/1 weft twill with a larger number of picks that ends per inch, giving what is also known as the “cashmere twill” or “plain back” (From a letter to the author dated 19-3-1954). 11 Moorcroft, MSS. Eur. E. 113. 12 G.T. Vigne, II, 124, and C.E. Bates, p. 55. 14 Moorcroft, MSS. Eur. D. 260, pp. 1-2. 15 Baden Poeld, pp. 43ff. 17 Moorcroft, MSS. Eur, E. 113, p. 7. 18 Ibid., Eur.F. 38, letter dated 21-5-1820. 19 Vigne, II, p. 127; and Moorcroft, MSS. Eur. E. 113,p. 10. 20 According to Moorcroft, pattern-drawers earned from 2 to 8 annas a day according to skill, compared with the weaver’s maximum of 1 anna a day; ( one penny). 21 C.E. Bates p. 56. 22 Only two operators when a very simple pattern was involved. 23 C.E. Bates, p. 54. 24 Moorcroft, MSS, Eur. E. 113, p. 17. 26 Colonel Grant quoted in Kashmeer and its shawls (Anonymous) p. 48. 27 C.E. Bates, p. 53. 28 A reduction of Rs. 2/- was made in 1867. 29 C.E. Bates, pp. 54-7. and R. Thorp.passim. 30 R. Thorp., p. 36. 31 Ain-i-Akbari,I,32. See also Palsaert, p. 36. and Manrique, I.p. 429. 34 Baden Powell, p. 43. 37 Marique, I, 428-9. These of course bear no relation to the comparatively coarse shawl-goods embroidered with gold thread in the Kashmir style, and produced in the Punjab in the late nineteenth century. 40 Thevenot, Ill, p. 37. 41O. Falke, fig. 35; and A.C. Weibel, fi1. 42 Moorcroft, MSS. Eur. G. 28, letter dated 12th November 1822. 45 A map-shawl, embroidered in 1870, was published in the Magazine of Art, London, Vol. 25, 1901, pp. 452-3. 46 Household Words, 28th August, 1852. 47 The Frenchman, Rey, writing in 1823, stated that prior to this period the cone was neer more thatn nine inches in height. J. Rey, p. 146. 48Textiles historians usually refer to this motive as the cypress ‘bent by the wind’; in fact it represents the natural form of the treek, the topmost shoots of which always bend. 49B.H. Baden Powell, p. 41. 50 B.H. Baden Powell, p. 41. 51 Colonel J.A. Grant, quoted in Kashmeer and its shawls (Anonymous), p. 48. 52 William Simpson, India ancient and modern, p. 5. 54 B.H. Baden Powell, p. 45. The particular shawl is reproduced in the forementioned work, facing p. 45. 55 The export figures were 171,000 in 1850-1, and 351,000 in 1860. Estimates of the earlier output are based on Moorcroft MSS. Eur. E. 113, p. 29. 56 According to evidence handed down verbally, Kashmir shawl weavers ere recruited for carpet- knitting. 57 B.H. Baden Powell, p. 46. 58 This was the name of the Prime Minister of Kashmir at that time. 59 Describing Kirman province, the French traveller Debeux remarked....on y voit un grand nombre de manufactures de chales qui imitent ceux du Caschmir’ La Perse p. 57. 60 Examples in the Victoria and Albert Museum (Textile Dept. ) are T. 41-1942, 1061-75 1061-a-75, and 346-1880. 61 Nos. 1064-1875 and 885-1877.